Mixing a few rarities into his set, the British singer-songwriter showed why he's the only one in music who can do quite what he does. He's all alone up there. 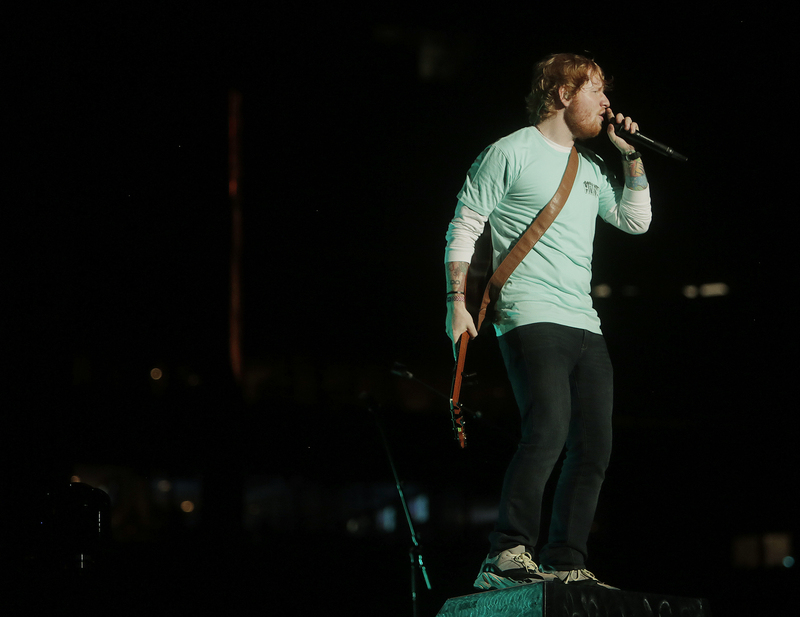 This, above all, remains the most astounding thing about the six-year rise of Ed Sheeran, the 27-year-old British busker who headlined Tampa's Raymond James Stadium on Wednesday. Solo acts just don't do this. They don't headline football stadiums with no band, no dancers, no DJ. It simply isn't done. Never has been. And yet here was Sheeran, at 27 the world's most bankable male pop star, packing in some 50,000 fans on a school night with little more than an acoustic guitar and some pedals. Six and a half years after playing one of his first stateside shows at Jannus Live in St. Petersburg, he sounded just as amazed by this as anyone. "The third place that I ever played in America was Florida," he told the crowd. "I just never, ever thought that there would be a point in my life that I'd be coming to do a stadium in Florida." But he's been building to it. With six shows in Tampa Bay since 2012, it seems fitting that RayJay, a venue 30-odd times the size than Jannus Live, would be the second-to-last U.S. stop of his long, ongoing world tour — and likely, he said, one of his last American gigs until 2021. "My job as an entertainer is to entertain you," he said. "And I promise if you drink enough beer, there will be one song you've heard on the radio a lot of times that you will sing along to." Oh, there was more than one of those, starting with the downhill adrenaline shot of opener Castle on the Hill. 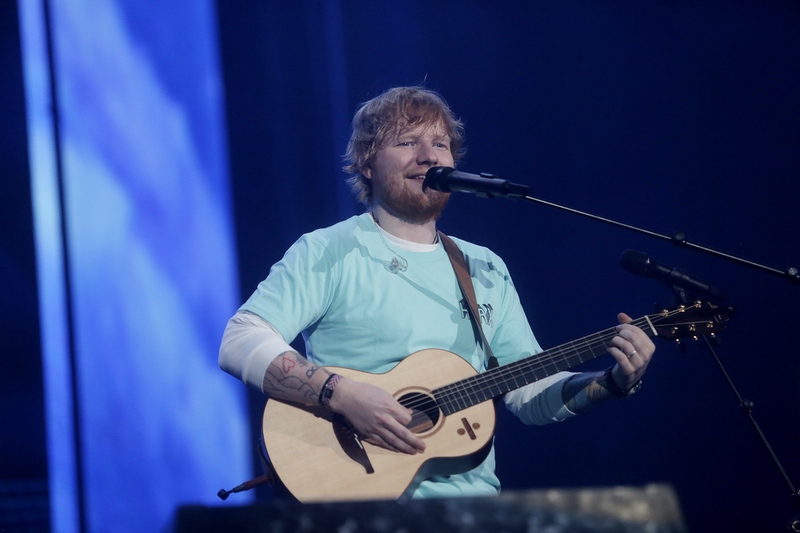 Straight away, Sheeran showed off his signature style on guitar, looping flicks of the finger and taps of the thumb through his pedals, layering vocals and harmonies until he became his own backing band. This is how he was able to sling the guitar back across his shoulder, grab a mic and take advantage of the larger stage, roaming and rapping with a laddish lilt on Eraser, Don't, New Man and frenetic closer You Need Me, I Don't Need You. It's how he swelled the crowd into a hand-swatting frenzy on the visceral thumper Bloodstream. And it's how he conjured a full Celtic folk band through his fingertips for the North Country pub-ticklers Galway Girl and Nancy Mulligan. Neat a feat as these are, it's still the songs that have gotten Sheeran into stadiums, especially his hanky-honking weepers. The A Team, a song he wrote at 18 and has played at every gig since, remains an aching snapshot of frustration and addiction. And a one-two-three blast of balladry he hung up near the end — Thinking Out Loud into Photograph into Perfect — had them singing and swaying up to the spotlights. That we all were in a cavernous NFL stadium didn't matter. Sure, Sheeran swung a little bigger at times. When he came out in a Bucs jersey for encore-opening smash Shape of You, fans who'd been on their feet the whole night danced like the concert just started. And local seismologists can probably pinpoint the moment in Sing when Sheeran commanded every fan to jump, causing the entire stadium to quake. But perhaps because he was just one guy up there, the place also felt strangely intimate, often quiet enough to speak and be heard above the music. 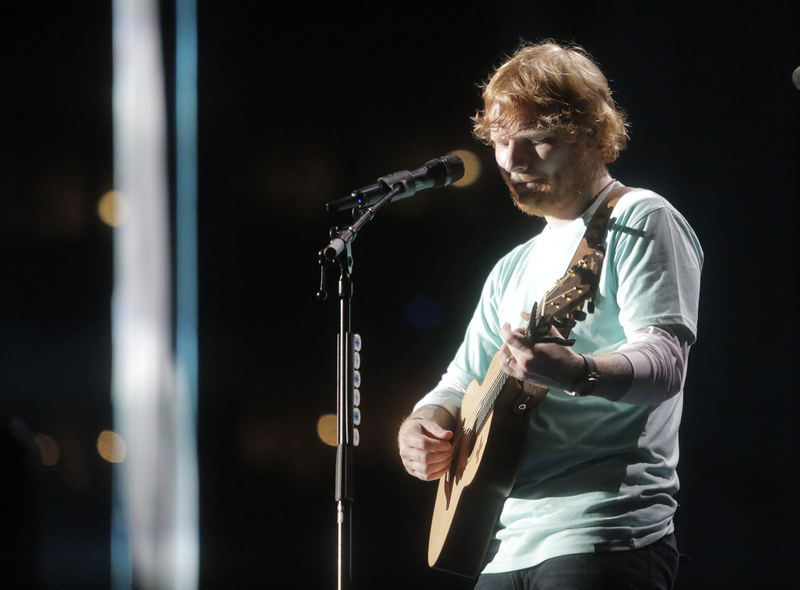 During one silent millisecond in Photograph, Sheeran shouted into the crowd sans microphone; you could hear his voice clear across the stadium. And definitely because he was just one guy up there, he figured he'd call a few frisky audibles. 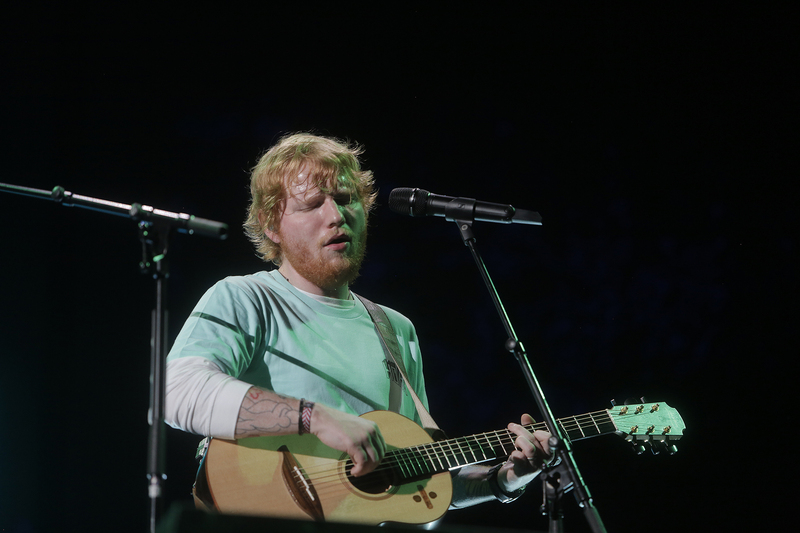 The first, in response to several fans' requests before the show, was Supermarket Flowers, a heart-crushing ballad he plays so rarely that he warned fans he might forget some lyrics. Of course, he never did. Then, an even rarer rarity: Love Yourself, a hit for Justin Bieber that Sheeran said he wrote on a tour bus in Florida, and wanted to play Wednesday because the tour was almost over, and why not. "It feels like sing-along time, doesn't it?" he said. 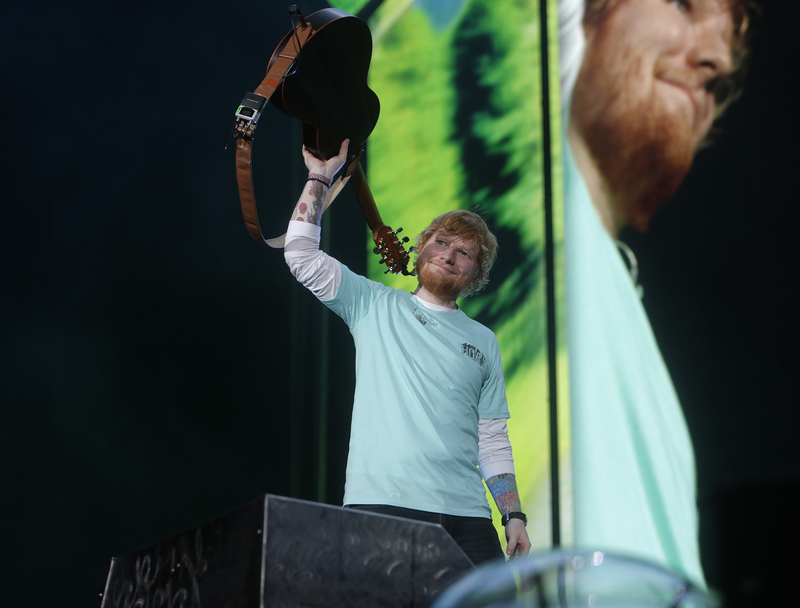 And then, when a roadie started to run out and hand Sheeran another guitar, the singer waved him off, calling audible No. 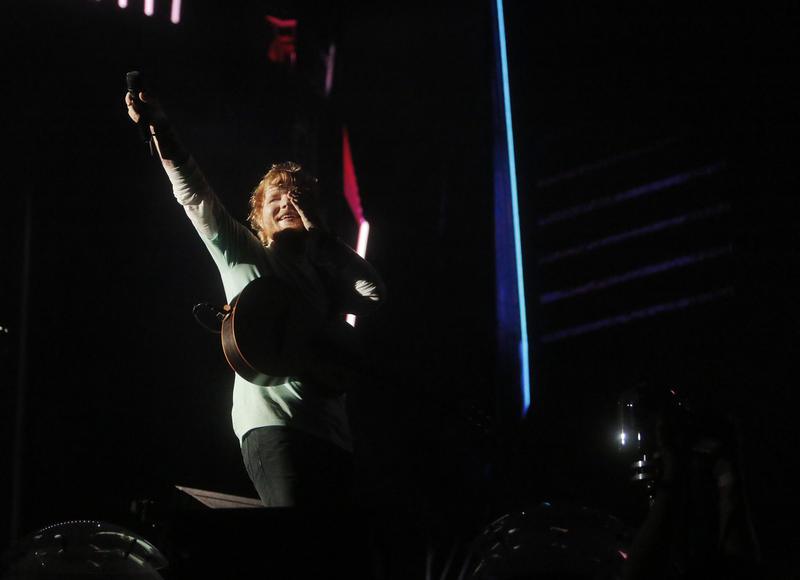 3: A medley of Lego House, All of the Stars, Give Me Love and Tenerife Sea. At one point you could see him tossing his eyes skyward, deciding which one to toss in next. "That is proof that all you need is four chords," he said. "I have been able to sell out this stadium with four chords." And that's something no one but Sheeran can do. Up there, he's all alone.